As our range comes from a number of suppliers, our products will differ in sizing to Australian standards in some cases. You will need to check the measurements on each item carefully prior to purchase to make sure it fits well. 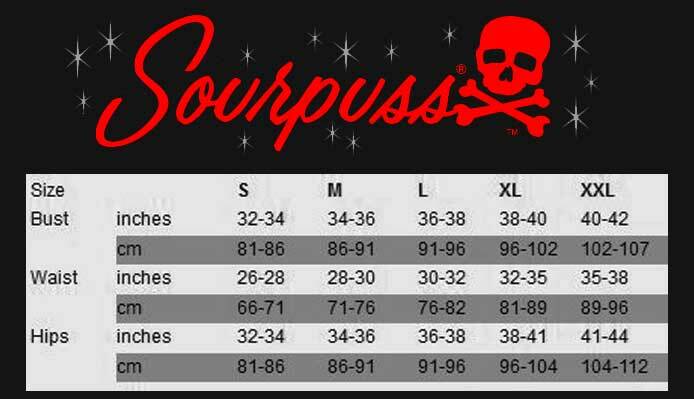 If you are unsure which size is best for you, please get in touch and we can provide the garment measurements for each item in store. If you find you have purchased the wrong size, we will happily exchange your item. Please contact us within 14 days of purchase. Cherry La Blaze Vintage and Rockabilly will not exchange on sale items or if the garment is damaged in anyway! If your item arrives damaged will either refund or exchange/replace your item. If possible, have someone else measure you to obtain the most accurate measurements. Bust - Measure around your back across the fullest part of your bust and keep your arms at your side with the tape straight, parallel to the floor. Natural Waist - Measure your natural waist line. This is your body's thinnest point just above your belly button and below your ribs. You can lean to the side to locate where your body naturally folds. Hips - Measure the fullest part of your hips which is usually your body’s widest part around the bottom. Please keep your feet together to ensure an accurate measurement. ﻿Lenny's Custom clothing is proudly made here in Australia. These products do come in standard sizes, however they are handmade and custom made to order. So the items that are on the website we may have in stock in your size. But if not, we will gladly order your chosen design with your personal measurements guaranteeing the perfect fit.